Becoming a co-parent is a life-changing experience. It's like jumping off a cliff and hoping for the best. At the beginning, it was challenging to refrain from criticizing the other parent in front of our child. I knew it was wrong because, as a child, I remembered my parents doing the same. When I think back to my early years of co-parenting, 30 years ago, my awareness about co-parenting was limited -- it was unknown territory. I had to figure out how to manage my emotions through the twists and turns of my new life. Becoming a co-parent is a life-changing experience. It's like jumping off a cliff and hoping for the best. At the beginning, it was challenging to refrain from criticizing the other parent in front of our child. I knew it was wrong because, as a child, I remembered my parents doing the same. The feelings of disbelief, anxiety and uncertainty were so present. I often wondered if I really mattered to them. It took patience and a period of adjustment. It took time and consistent effort to master effective co-parenting skills, get used to negotiating, find ways to communicate calmly and courteously, and to top it off, remain diplomatic while negative emotions between parents were evident. At times, it was like walking on eggshells. The adjustment wasn't merely about setting up a two-home concept and sticking to a schedule, it was about helping our child feel safe and loved. As a child, I was smack in the middle of my parents' drama, and to avoid passing on the same pattern, I knew that I needed to develop new skills to empower the situation. To make things work, we needed to cultivate empathy, patience and flexibility. Read on to discover four useful tips below to help you with this. On the path of learning and discovery, one of my "aha" moments was to never underestimate a child. Children are wise. They know so much more than we give them credit for at such a young age. That's why we have children in our lives; they serve as our mirrors and teach us to take a good look at our actions and at ourselves. Recently, I had a conversation with my stepson who expressed the long-term effects of badmouthing your ex. Although he has grown into a wonderful adult, he still recalls overhearing an unhealthy conversation we had about his other parent in the car as a child. He expressed how hurt and angry he felt about what was being said, and that he loved his parents. We felt so guilty. Naively, we thought a young child wouldn't have had the slightest clue to what was going on. Truth be told, I admire him for whom he is. He was courageous enough to express how hurtful the unhealthy conversation was. Children can feel your negative energy. It is expressed in your tone of voice and in the choice of words you use. We have the tendency to forget that a child sees half of himself or herself in the other parent. 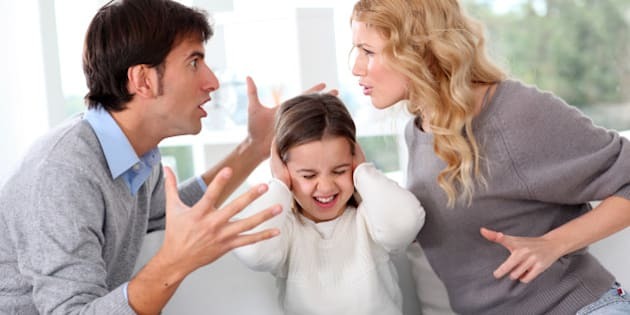 Know that parental conflict is tougher on the child than the divorce itself, therefore, speaking respectfully about your ex-spouse in front of your child is extremely important to your child. Over time we realized that it wasn't about us, about who was better, nor about who was the favourite parent. It was really about being child-focused and doing what was in their best interest. Once you focus on being child-centred and not on what he or she said, everything begins to fall into place. We are all human, and we all need to vent -- but not in front of your child, no matter what. A child wants to be loving and trusting. If you make that impossible by badmouthing the other parent in front of your child, it will eventually backfire and your child will resent you for it. The resentment might not show when they are young, but it will resurface in their adulthood. Using sarcastic comments will not cause a child to love you more. If anything, it will cause resentment and frustration to the point that your child may push you away even when you try to express your love for them. I know firsthand as I've experienced this resentment and anger toward my parents. No child likes to hear any critiques of their other parent. It really hurts their feelings. What behaviour were we modelling at the time? We were surely not thinking of our child's best interest. Taking 100% responsibility for our own behaviour, turning the negative into a positive outcome was more important than badmouthing and maintaining negative emotions. Instead of getting distracted and wasting energy trying to control the other parent, stop and observe what matters. The more you believe in your parenting skills and in your own qualities, the less you will feel the need to criticize. Whatever was said, ask yourself the question: Will it really matter in 10 years from now? Each parent has their own qualities and they all try to do their best. As adults and as co-parents, you cannot change the other parent and their unique personality. Be confident, offer positive parenting, when you judge others, it's a projection of yourself. Believe in your qualities and how much of a good, lovable parent you are and can be. Focus on giving your child unconditional love. Don't let the presence of another adult in your child's life be a negative or threatening experience. Focus on what truly matters: your relationship with your child and their needs. Look at the bigger picture. As a certified coach practitioner and co-parenting coach, I tell my stories to guide and transform separated and divorced parents to shift from hurtful communications to consciously communicate respectfully, so that they can co-parent and step-parent in harmony. To learn more about Anna's work, check out her latest e-book on how to co-parent in harmony.